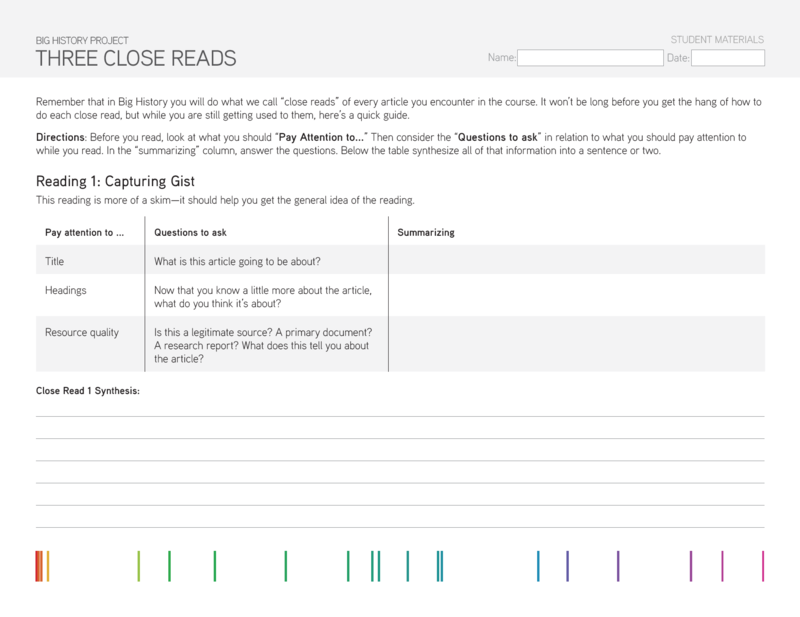 The three close reads method helps students interact with the text as they read. As you’ve probably gathered from the name, it encourages students to read the text three times. The first read is just a skim, the second is informational, and the third is conceptual. Admittedly, this process—though necessary—can be a bit tedious for students. But then again, my students never erupt into applause when I introduce new reading strategies. They do see improvement, though, and it’s then that they realize the hard work is worth it. We saw tremendous growth in reading and writing skills from our students last year. Although they might not admit it, a lot of this progress stemmed from the routines and good habits we developed using three close reads. Every close reading we did was followed up with a dynamic Socratic seminar, in which students questioned both the text and each other. There is something truly awesome about seeing a student actively engage with the text. I think students have this preconceived notion that they’re just supposed to accept whatever we feed them as teachers. For so long, they’ve been good robots, plodding along reading their textbooks and taking notes. To let them question the text and engage with one another in contemplative dialogue changes the entire classroom environment. By the end of the year, students begged for opportunities to read, think, and interact with one another. When we began the year, several of our students could barely construct a paragraph of original thought in response to prompts on our driving questions. Their lack of writing skills was not due to their inability to think, but rather the struggle they had accessing the information in the documents they were reading. Once students established a habit of searching out critical information and connecting it to Big History themes, they were unstoppable. The best part is that these skills carried over into other courses. I heard stories from teachers of students asking to write in their textbooks. Students were making Big History connections in their other classes. Most important, their writing and thinking just kept getting better and better. Let the literacy skills in Big History serve as a vehicle for the content. Establishing these routines help students access information they need to think deeply about course themes. While you might never get that standing ovation you deserve for high-quality literacy instruction, your students will certainly become better readers, writers, and thinkers using the three close reads method. About the author: Rachel Hansen is a high school history and geography teacher in Muscatine, IA. Rachel teaches the BHP world history course over two 180-day semesters to about 50 ninth- through twelfth-grade students each year. Register to explore the Big History Project course.